Let's say you got a totally unexpected $1,500 tax refund. And let's imagine you did not have a coughing car engine or elderly roof to replace. 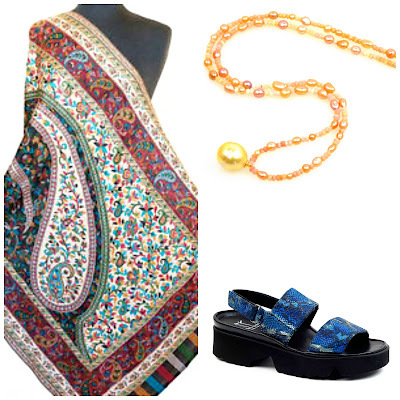 I'd head for vintage to stretch my windfall, or invest in something new that's one-of-a-kind and personal. Below, a half-dozen contenders. 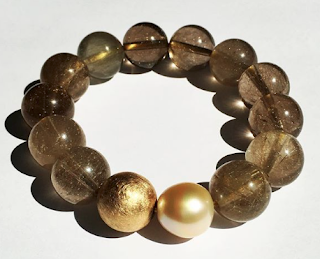 Nothing says splurge like the serious stones, and in the spring sunlight, diamonds really sparkle. 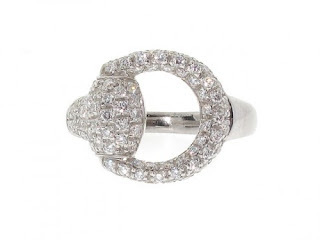 The tailored diamond horsebit ring is .70ct of pavé set in white 18k gold, not too blingy, but there. At $995 you have some money left to treat your kids or pop a cheque in the mail to a good cause. If you are presently married to the person who gave you the original, keep the sentiment and the stones, if any (the stones, I mean; one hopes the sentiment has only deepened). The ER/wedding ring set is as passé as a hairnet. Change to a single band or stacking rings of which the wedding band is but one. 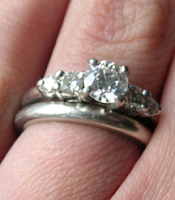 Repurpose the ER diamond to make one special new ring. This Kothari single diamond ring ($3,750 at Twist) is shown below as an example. Your $1,500 pays for the restyling; you could go over budget if you decide to add stones. You might welcome the ring with a ceremony, quiet or splashy as you wish. 3. Make it a hoot! A number of my friends are felicitously single (or at least finally single); in that case, splash out on a bold ring with personality. A vintage (ca. 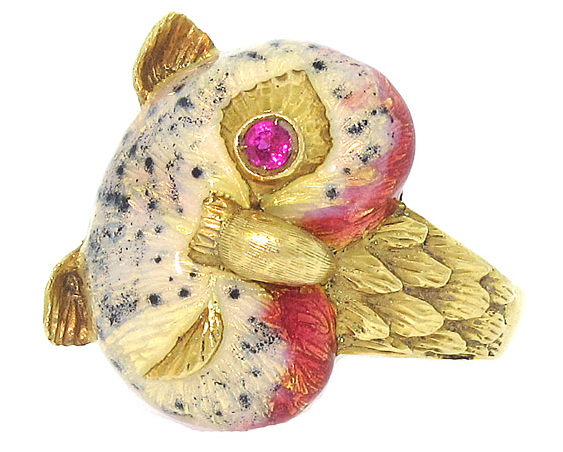 1970s) winking enamel owl (with a ruby eye) is another wised-up bird. Price, $795. Julie Wolfe makes the best vintage necklaces from found and handwrought elements; her cameo pendant with charms is more rocker than 'lady'. It's $1,390 at Twist and while I find it a bit dear, Wolfe's sense of composition earns its price. 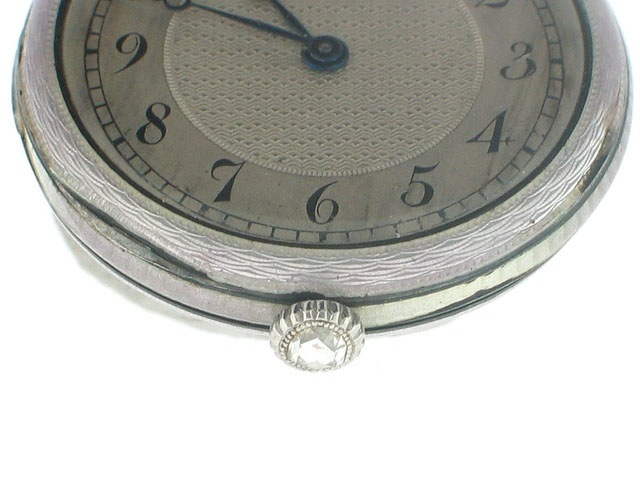 Imagine at your next meeting when you check the time with an Edwardian enamel pocket watch. It's on a gorgeous 30-inch chain (look at those enamel bars! 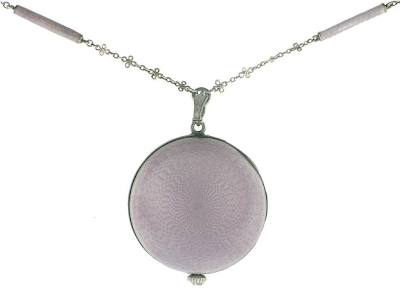 ), to wear around your neck. The lavender guilloché enamel, the tiny diamond on the stem; really, is this not the height of an elegant accessory even if you never use it for the time of day? I suppose you could stick your glasses on the chain if you need it to do more. I am not a Label Girl, and advise against paying "brand tax" on production pieces that aren't worth it. 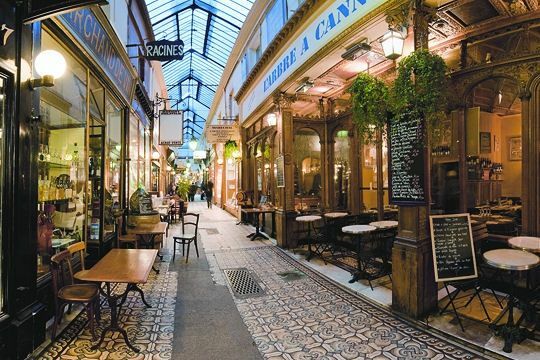 But some of the great houses make elegant jewelry and the way to get that is the secondhand market. You could hit the auctions, but Beladora have done the legwork while keeping prices in line. This size 4.5 18k Hermès rolling ring of white and yellow gold has the added plus of being detachable: you can wear each singly (which makes the rings larger (an 8) so they move to another finger when worn alone.) Price, $1,450. Can you tell who's just dropped her return in the mail? Beautiful...but the taxman taketh from me and not giveth!! I do have some stunning costume jewelry on my blog today! Have a good one! Wonderfully curated pieces as always, Duchesse. That watch is really a wonderful way to combine beauty and function. I'm still stopped, wistfully daydreaming, at your opening concept. In fact, we had a considerably different situation here, what with Pater's post-retirement contracts and all, and I just "wrote" the cyber equivalent of a big cheque. Sigh. 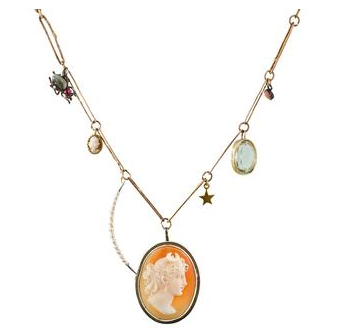 But if I could spend the sum you've suggested, that too-gorgeous Cameo/charms necklace would be mine, mine, mine. So dainty yet so striking! Love it! With our younger daughter off to college in the Fall, I probably won't be buying any important jewelry, though I did treat myself to an oddball vintage piece I couldn't resist: a choker of looped lipstick-red glass beads dangling to a point, cowboy-bandanna style, in front. Love it. If I did have an extra $1,000 or so, the lavender enamel watch and chain would suit me perfectly, and that owl ring is delightful. I see that it has disappeared from the website; has it flown to your finger by any chance, Duchesse? Ah...if only! The horsebit pavé ring is stunning. We submitted our tax returns a few days ago but I suspect all of the refund will be going towards the mortgage. Lovely dreams. Our refund is going to a boat. It will be fun, but it won't sparkle like a diamond ring. No refund at our house, but the good news is that we pay ahead and never owe additional. I can be happy about that. I understand the idea of a single ring to designate marriage, and some years ago, I suggested that to my husband. I wanted to use a lovely diamond ring he had given me as a wedding ring, but he would have none of it. So, I wear the very slim platinum band he gave me almost 37 years ago together with a lovely diamond ring. Sets may be passe, but our marriage and commitment to each other is not. Would I love to have another piece of jewelry? Yes, but I am a bit too conservative to put that want above more practical considerations. Any extra $$ go into retirement investments. Something you can see.....I always wear earrings and hadn't thought about the 'seeing' aspect. Your post is thought provoking as always. And thank you for mentioning the Fred Ward book about pearls in a previous post. I started with that, of course, and went on to read his others - Diamonds, Opals, Rubies and Sapphires, and Emeralds. They're all fascinating, with great photos and great buying tips. Too bad I can't "wear" private school tuition which is where any refund goes. The good news is that , for once, I was ahead of the curve when I chose a single band with an emerald-cut diamond for my wedding ring. I still get compliments on my 26- year-old ring. Love the watch you show, Duchess. Wedding sets are passe? Then almost all married women I know are passe... or maybe it's a cultural/generational thing? I've been married about 12 years and I still enjoy looking down at my diamonds and wedding band. I got an eternity ring for our 10 year anniversary and am looking forward to another little something for 15 years, then 20 etc. etc. Not another ring though, because one finger filled up on each hand is enough for me. -80% use return to pay down debt, only 10% use it on luxury items. I'd never suggest anyone go further in to debt for jewelry, but if one has no debt, these are ideas. birdybegins: Yes, they may well be, *in this respect*. The two-ring set was a convention of its time; styles move on. It's still sold; in that case, pieces worn with it look best when they are traditional or vintage. I write this blog for women past 50. If they have WR/ER sets, they are from the '70s and '80s. Thirty to Forty years makes a difference. It would be fun to purchase some jewelry with the return...I did, indeed, splurge just a tiny bit, getting two vintage gold charms for my bracelet, but I couldn't spend the whole lot. Need furniture, a slight bath upgrade, other house stuff. I will say, should I remarry/commit to someone (could easily skip the wedding thing) again, I would get a Cathy Waterman band, and mix it with the other estate bands and odd stuff I've collected. More interesting by far. But, then again, I got an antique sapphire and diamond ring the first go-around, with much more joy than a diamond, which never was my style. 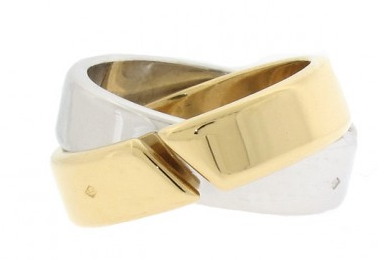 Gretchen: There is a grace to Cathy Waterman rings that truly belongs to her designs. Any woman wondering what a beautiful, current wedding ring might look like would be wise to study these styles. I alternate among four wedding bands, gifts over 27 years. The original was lost on a trip, but I often think of replacing it, too. And like you, I mix in other coloured-stone rings, or stack bands.